AT&T just announced that it will have an exclusive to Nokia's new Lumia 920 Windows Phone 8 smartphone, as well as its little brother, the Lumia 820, this fall. The Lumia 920 is equipped with a 1.5GHz dual-core processor, 1GB of RAM, a 4.5-inch display with a 1280 x 768-pixel resolution, 32GB of storage, an 8.7-megapixel camera with Carl Zeiss optics and amazing low-light performance, a 1.2-megapixel front-facing camera, 4G LTE support, wireless charging, NFC and much more. "Exclusive to our customers and featuring unique innovations in imaging technology, wireless charging and a bright, sensitive display – all on the nation's largest 4G network – the Lumia 920 will be one of the hottest phones for the holidays," said Jeff Bradley, senior vice president – Devices and Developer Services, AT&T Mobility. AT&T will offer the Lumia 920 in red, white, black, yellow and cyan. The Lumia 820 will no doubt be a more affordable option and sports a 1.5GHz processor, 1GB of RAM, a 4.3-inch ClearBlack dsplay with an 800 x 480-pixel resolution, 8GB of storage, a VGA front-facing camera, 4G LTE support, an 8-megapixel camera with a Carl Zeiss lens, and more. AT&T will only offer a black version of the Lumia 820. Both devices are expected to land in November but AT&T has not yet provided pricing. Today, AT&T* announced the addition of the Nokia Lumia 920 and Nokia Lumia 820 to its growing Windows® Phone 8 portfolio. The unrivaled leader in Windows Phones, AT&T has sold more Windows Phones than any other carrier. The Nokia Lumia 920 includes the latest advances in Nokia PureView imaging innovation. The 8 megapixel rear-facing camera records HD video in 1080p at 30 frames per second, while the front-facing camera records in 720p HD. Using advanced floating lens technology, the camera in the Lumia 920 is able to take in five times more light than typical smartphones without using flash, making it possible to capture clear, bright pictures and video indoors and at night. It also compensates for hand movement while the photo is being taken. In addition to built-in wireless charging**, the Lumia 920 also comes with Nokia City Lens, the latest addition to the Nokia location suite and the start of a new augmented reality experience that also enhances Nokia Maps. Know more about the neighborhood than the locals. Using the phone's camera viewfinder, Nokia City Lens basically turns sight into the next interface for searching the world around you. The app provides information about each building or landmark in the area giving the user an at-a-glance understanding of what restaurants, museums, shops and others places of interest are nearby. Along with enhancements to Nokia Drive and Nokia Transport, the Nokia location suite of services represents the most comprehensive, integrated mapping experience of any smartphone. Viewing videos or browsing the web is more enjoyable than ever on the 4.5-inch PureMotion HD+ ClearBlack display, which is made of Corning® Gorilla® Glass 2.0 and comes with Sunlight Readability Enhancement technology and High Brightness Mode, allowing you to view your screen outdoors, even on a bright day. In addition to its durable, scratch-resistant curved display, the Lumia 920 also has a new sensitive touchscreen that lets you use the device with fingernails or while wearing gloves. "Exclusive to our customers and featuring unique innovations in imaging technology, wireless charging and a bright, sensitive display – all on the nation's largest 4G network – the Lumia 920 will be one of the hottest phones for the holidays," said Jeff Bradley, senior vice president – Devices and Developer Services, AT&T Mobility. "We welcome AT&T's decision to offer the Nokia Lumia 920 and Nokia Lumia 820, which, when added to what we've witnessed in other markets, underscores the momentum behind our Lumia devices and the broader Windows ecosystem," said Olivier Puech, president of Nokia Americas. "Our continued collaboration with AT&T is an important component for Nokia's success in the U.S. market." The Nokia Lumia 820 is a snappy, mid-range smartphone that delivers high-end performance in a compact package. While the Nokia Lumia 820 has the same unibody look and feel as the high end Lumia smartphones, it comes with an exchangeable shell design. Exchangeable shells not only make it possible to select from a range of colors, but also to add wireless charging. Beneath the shell is room to insert a micro SD memory card. 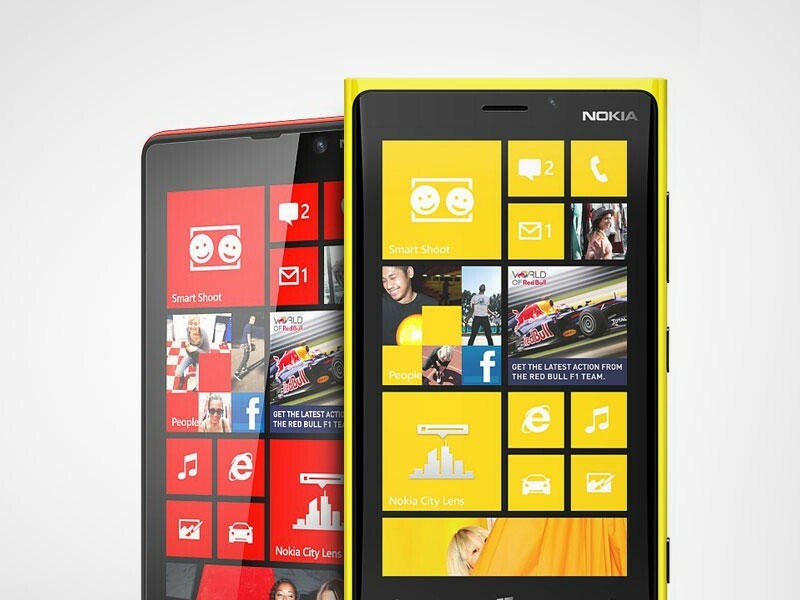 The Nokia Lumia 920 comes in red, white, black, yellow, and cyan while the Nokia Lumia 820 comes in black. Both phones will run on AT&T's 4G LTE network and are planned to be made available from AT&T in November. AT&T customers have access to the nation's largest 4G network***, covering 275 million people. AT&T has two 4G networks that work together for customers, LTE and HSPA+ with enhanced backhaul. That means AT&T customers are able to enjoy a widespread, ultra-fast and consistent 4G experience on their compatible device as they move in and out of LTE areas. With smartphones on other carriers' networks, when you travel outside of their LTE coverage area, you may be on a much slower 3G network.